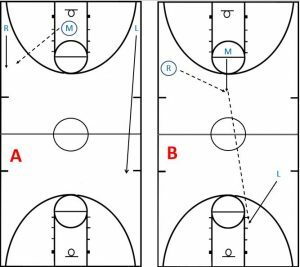 This drill is from the Xavier Men’s Program Basketball Coaching Newsletter. Editor’s Note from Brian. A lot of teams run a drill similar to this, but the idea behind this post is to set the expectation of perfection, no bobbles, bad passes, missed layups, etc… when you are doing warm up or technique drills. a. A player dribbles the length of the court and shoots a right hand layup. He gets his own rebound and dribbles the length of the court and shoots a second right hand layup. The next player in each line goes when the player in front of him is at half court. b. A player dribbles the length of the court and shoots a left hand layup, he gets his own rebound and dribbles the length of the court and shoots a 2nd left hand layup. The next player in each line goes when the player in front of him is at half court. c. “Box to box”- two players stand as wide as the lane. One ball is utilized. Both players run the length of the court passing back and forth to each other without dribbling. A player shoots a layup. The passer rebounds the ball and the shooter continues on, turns and runs back. The rebounder passes the ball to the shooter and they once again pass back and forth to each other without dribbling until the second layup is shot at the other end. e. “Three man weave”- Three or four passes. No dribbles allowed. f. “Three man weave with jump shot”- Instead of a layup, a ten foot pull up is shot. A dribble by the shooter is permitted. Any travel, bobbled pass, turnover pass or missed shot (exception for F) the group or player must go again until perfection takes place. Every player on the team goes once each on A, B, and twice each on C-F segments of perfection. Diagram A: The M player passes to the R player. The L player runs wide and at an angle to the basket. 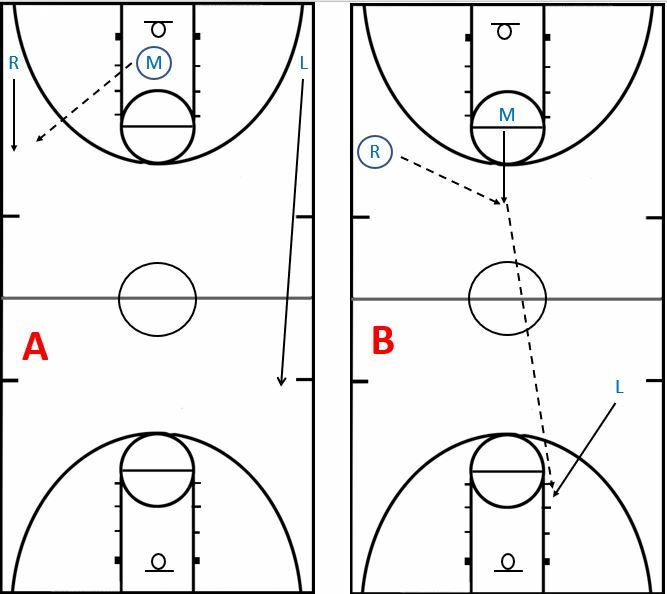 Diagram B: The M player receives a pass back from R and delivers a pass to L on the run so that L doesn’t have to dribble. Diagram C: The L player shoots the lay up and crosses with R to return back to the original end. M rebounds the ball. 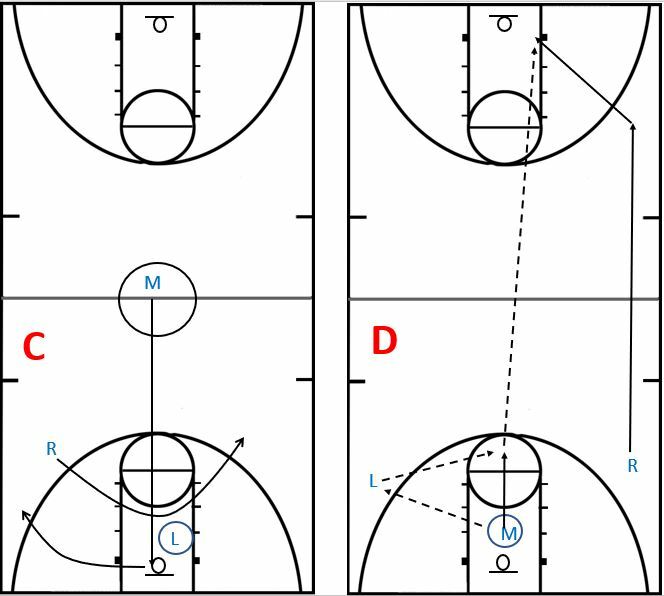 Diagram D: M passes to the L player – because L shot the layup. L return passes to M and M delivers a 3/4 court pass to R in stride for the groups second layup.